Shinobi Ninja Blade Runner Sword | BUDK.com - Knives & Swords At The Lowest Prices! This Shinobi ninja blade runner sword has all the ferocity you would expect it to have. Inspired by the popular video game series, it features a 26-1/2" 440 stainless steel blade with a piercing tanto point. 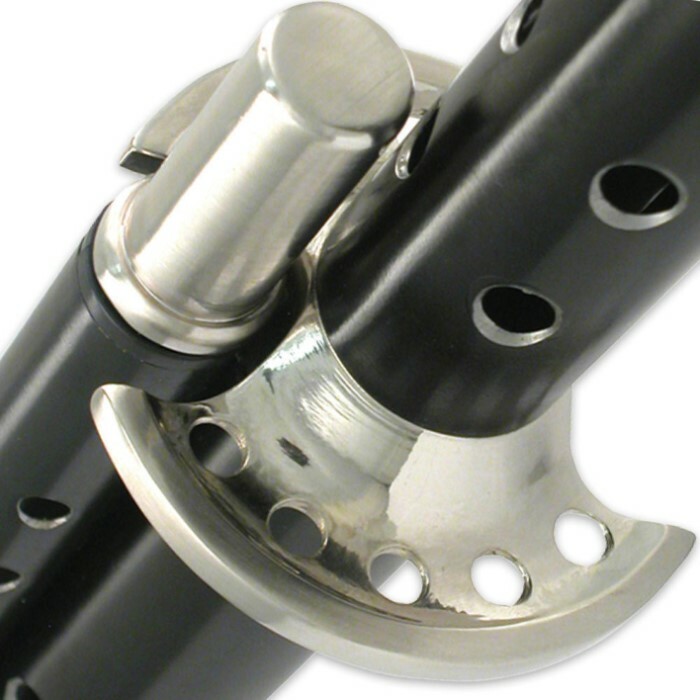 The metal handle matches the metal scabbard, which has the look of a self-defense pipe. The scabbard also houses a 6-1/4" stainless steel tanto dagger. This is my first sword from trueswords and i was expecting a lot and it was met. You cant see it in the picture cuz they did it against a white back round but there's a super cool chunk of metal taken out in the middle. look at other sights for this sword and you will see it. the holes on the sword are cut decently well but if you ever lost your grip these holes would cut you. It came decently sharp but not sharp enough to go through cardboard. The inside of the scabbard has industrial foam in it so when you pull it out it might sometimes screech, not good for stealth, this is a great beginner blade. 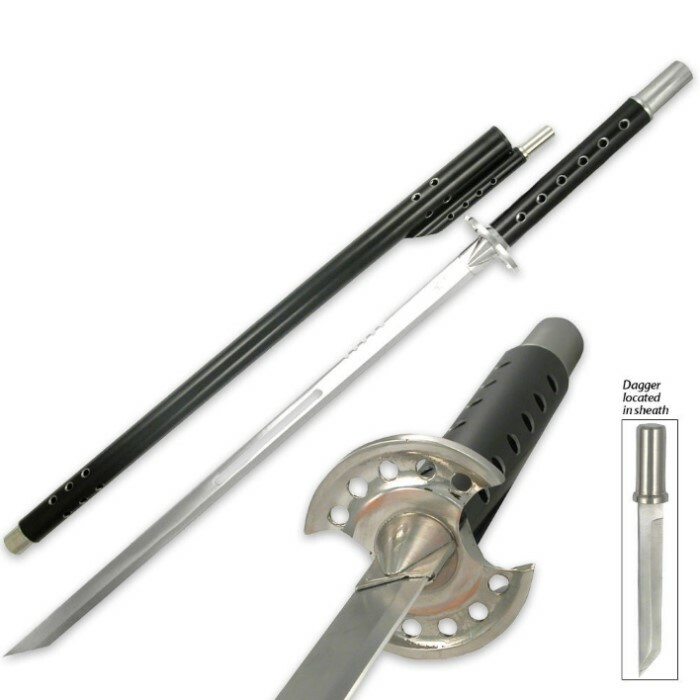 The knife is pretty cool but its sharper then the sword and i would use this in a fight as a last resort. THIS IS NOT A KATANA THIS IS A NINJA BLADE. Time for my complaints, The dagger has a large error on the side where it should be straight but its curved. The swords holes can hurt you if your not careful so i wear gloves when i use this. The blade is full tang but i was unhappy when my friend pointed out that the blade was coming off the handle way to far to the right, i got this for christmas so i think its to late to get it fixed or return it :( it might have just been me. Lastly the part right before the sharp part has huge production lines on it and does not feel smooth. Came really fast. Order on Sun. shipped on Mon. Arrived on Wed. Two bad things about this, 1) the hole needed to be more smoother. Almost cut myself just by touching it. 2) the little dagger came out of its little handle but super glue fixed that. Over all, it was a great buy. Came SHARP so dont go playing around with it. This sword is badass and is heavy don`t plan on carrying this one all day with out a back strap. future ninjas beware. And again fast shipping thanks TrueSwords. its an awesome sword my only complaint is that when i got the sword the smaller knife/dagger that came with it was poorly put together because the blade kept coming out. i had to glue it together. it wasnt a problem but aggravating that i had to do it. in awesome shape, light and easy to handle.